“Field Trip Publishing” This project aims to inspire emerging Kansas City area artists to consider experimenting with new art making practices, collaboration, and marketing. Additionally, it will engage new art audiences by producing affordable art multiples and maintaining a dynamic, active online presence, and initiate active distribution in a way that will bolster the region’s art market and provide further financial support to local artists. Over the course of the year, Field Trip Publishing, composed of artists Eric Dobbins & Kelly John Clark will actively pursue 8 collaborative projects with emerging artists from the Kansas City Metro area. The results of each collaboration will be a union of each artist’s conceptual motivations and the Field Trip team’s conceptual and technical direction. Artists will be asked to work outside of their traditional media and methods as they collaborate with the team to conceive, design, produce, distribute and market expertly crafted, limited-edition work in a wide variety of art making practices. Examples of these works could include: prints and other paper goods, sticker sets, badges and pins, tote bags, tee shirts and wearables, housewares, ’zines and booklets, plush items, and more. 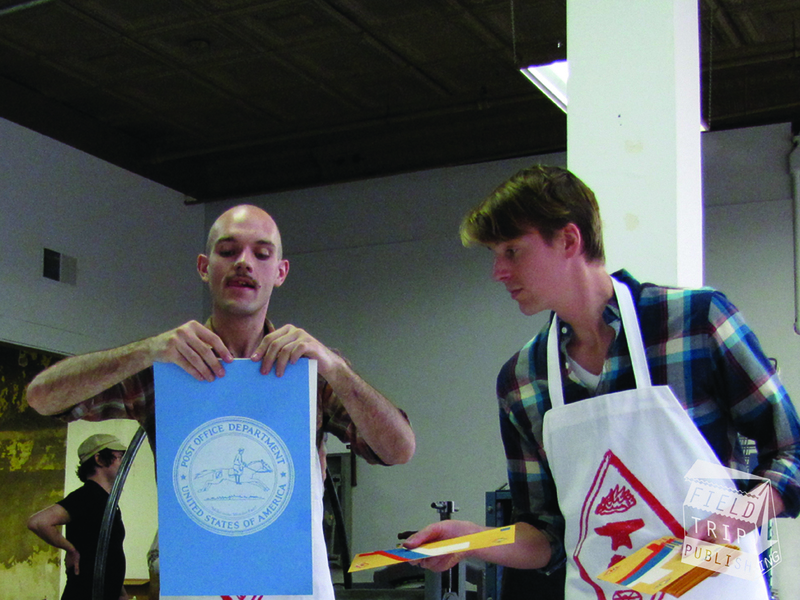 The fruit of each collaboration will be exhibited in a final showcase and workshop to be held at the artist-run Wonder Fair space in Lawrence, Kansas, as well as at a venue in Kansas City. Eric Dobbins and Kelly John Clark have been a part of the do-it-yourself handmade renaissance in the Kansas City region, and Field Trip Publishing is inspired by a passion for artistic collaboration and a devotion to the creation of unique, affordable, high quality art objects. Additionally, Field Trip aims to address the contemporary studio practice model of ‘artist-as-promoter/merchandiser’, as exemplified by a bevy of modern day art stars including Jeff Koons, Takashi Murakami, Damien Hirst, and Nick Cave. The premium now placed on merchandising, promotion, and production has given rise to the need for artists to supplement their own studio output with studio staff and sophisticated production techniques. Field Trip Publishing hopes to enable local, emerging talents to experiment with merchandising and manufacturing by serving as design, marketing and manufacturing collaborators. As head merchandiser and founder of Wonder Fair, Eric Dobbins has three year’s experience working with artists in order to provide the public with a unique, engrossing shopping experience rooted in an appreciation of the handmade. His additional experience as in–house carpenter, screen printer and idea man positions him as an ideal collaborating partner for any artist. As the book keeper at Wonder Fair, Kelly John Clark understands how money and merchandising function in a fine art context, from paying out artists to maintaining consignment and retail inventory. Additionally, Clark has 10 years’ experience collaborating through printmaking with professional artists in print shops, teaching classes on traditional and alternative print methods, assisting students in a variety of media in the classroom.